Today I would like to show you the layout that I did for this month's Color Challenge at The Memory Nest. 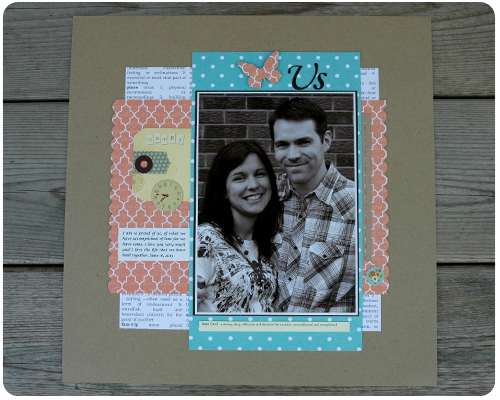 When I saw the colors for this challenge I immediately thought of the Tell Your Story paper line by Teresa Collins. I converted my picture to sepia so it would coordinate better with the patterned paper (and to hide my roots - I really needed to dye my hair when this picture was taken, truth be told). To embellish the page I rooted through my stash to come up with the tag from Pink Paislee and the clock from Making Memories. 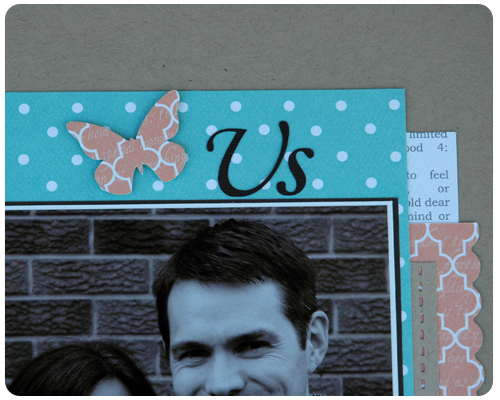 I cut my title (font: Monotype Corsivia) and the butterfly out using my Silhouette. Now, awhile back I completed this layout using this same line of paper and a picture from when Steve and I were dating. The layout that I am showing you today is of us a few weeks ago - married almost ten years with two little girls and a life built together. 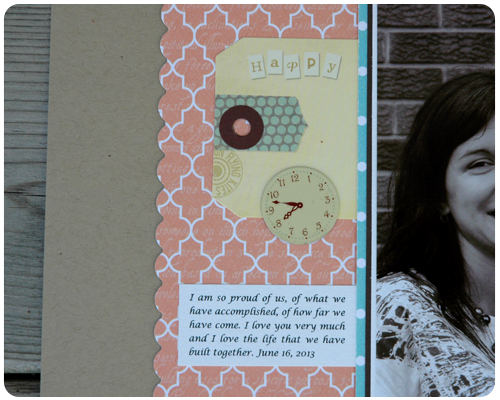 When I put these two pages into my album, I am going to put them side by side, as sort of a then and now, two layouts to celebrate where we started and how far we have come together. A beautiful addition to my scrapbook, for sure. I don't have many pages of Steve and I outside of our wedding album, so it will be nice add these pages as a way to celebrate us. I love this! You're making me want to get my old scrapbooks out and have another go at them. :) Thank you for sharing!